We at WRO are pleased to welcome Panos Kakaviatos to our ranks. A native of Washington D.C., Panos has been writing about wine professionally for 20 years. Now based in Strasbourg, France, he manages the wine blog wine-chronicles.com and has written for Decanter, The World of Fine Wine, Somm Journal and the news page of Wine-searcher.com, among other wine publications. Panos is invited regularly to judge at professional tastings and enjoys organizing wine dinners in Europe and in the U.S. for like-minded wine lovers. Although his primary focus is French wine, he enjoys tasting in wine regions around the world. He is working toward his WSET Diploma, and has also been employed as a sommelier. Based in Strasbourg, since 2011, where he works a “day job” for the Council of Europe as a spokesman and media relations specialist, Panos typically visits Burgundy or Bordeaux during the wine harvest, and regularly attends the April barrel tastings of Bordeaux as well as the Hospices de Beaune wine auction in November. He has also been designated an “Ambassador” for both Champagne and Châteauneuf du Pape. Although Panos is (literally) most “at home” with European wines, he’s quite well-traveled and very broadly experienced. With a linguistic arsenal including French, German and Greek in addition to English, he has the tools and the “chops” to contribute strongly to our coverage of the wine world. Please check out Panos’ first column--now up on the site in this week’s issue--regarding possible improvements to the labeling of Alsace wines. On behalf of all my WRO colleagues, welcome aboard, Panos! I was “jonesing” for a Manhattan on a recent summery evening. Of course, I might have had a Brooklyn, a closely related cocktail that calls for rye, plus dry rather than sweet Vermouth, and Maraschino liqueur. And since we’re on the subject of New York boroughs, instead of a Manhattan I might have put together a Bronx (gin, both dry and sweet Vermouth, plus orange juice); a Queens (like a Bronx, but with pineapple instead of orange); or a Staten Island (rum and pineapple juice). But pleasing though these variations might be, none of them would quite satisfy my yearning for the soothing, soul-warming mingling of Bourbon and sweet Vermouth. As I began assembling the fixings for my Manhattan, I was momentarily dismayed to discover that there were no cherries to be found in the house. But necessity being the mother of invention (especially when it comes to cocktails), I scanned the pantry shelves and found the perfect solution to my problem--dates! Take my word for this: If you’ve never tasted a Bourbon-soaked date you are missing out on a great organoleptic experience. Use whatever whiskey you prefer. On this occasion I was in the mood for a velvety smooth, sleek and somewhat sweet whiskey such as Eagle Rare Bourbon. Distilled, bottled and aged (for no less than ten years) at the Buffalo Trace Distillery, this Bourbon offers a complex nose with suggestions of dried orange peel, leather and oak. On the palate, it is unabashedly forthright, sweet (but not too sweet), and pleasantly oaky, with a clean finish. Stir the Bourbon, Vermouth and bitters together with ice cubes. Muddle the date in the bottom of a cocktail glass. Strain the liquid ingredients into the glass. Enjoy! Pinot Fin is a clone of Pinot Noir that produces smaller berries and thicker skin, according to the internationally acclaimed wine expert, Jancis Robinson. It’s rarely grown in Burgundy today, because it’s a finicky grape to grown, even more troublesome than Pinot Noir, susceptible to many diseases that result in lower yields--meaning, more expensive wine. Nonetheless, Geantet- Pansiot, one the top producers in the Côte de Nuits (he makes spectacular Gevrey Chambertin and Chambolle Musigny that sell for triple digits) produces a small amount of Bourgogne Rouge from this clone of Pinot Noir. 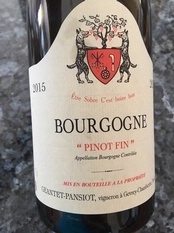 While I remain a great fan of the top Burgundy négociants, such as Bichot, Bouchard Père et Fils, Drouhin, Jadot, and Latour, because of their depth of production and overall quality, I’ll be the first to admit that a Bourgogne Rouge (or Bourgogne Blanc) from a top grower usually beats one from a négociant. These “minor” wines from the top growers often prove to be hidden gems in today’s stratospherically-priced Burgundy market. It’s always a good bet that the grapes used to make these wines came from vineyards located near the estate’s base. In the case of Geantet-Pansiot, that means Gevrey-Chambertin, Chambolle-Musigny or Marsannay, three renowned villages where he owns vineyards. Now, don’t be fooled. Geantet-Pansiot’s Bourgogne Rouge does not come from within the confines of those appellations. The grapes likely come from nearby plots that lie outside the limits of those revered appellations. Hey, it may not be Rockefeller Center, but it’s still New York City. By comparison, négociant Bourgogne Rouge--or Blanc--can come from anywhere within Burgundy, perhaps comparable to New York state to pursue the analogy. Grower Bourgogne Rouge or Blanc will not be cheap. But you will get a glimmer of what the producers’ wines are like. Even they may not be able to make, as the saying goes, “a silk purse out of a sow’s ear,” but often they make wine, as in this case, that hits well above its appellation. A word about the price. Wine-searcher.com tells me that the wine is available in just two stores in the U.S., MacArthur Beverages in Washington, D.C. and Astor Wines in New York City, both superb outlets for fine Burgundy. The dramatic discrepancy in price noted above highlights our Byzantine alcohol regulations. It is my understanding that MacArthur can import the wine directly, whereas Astor must acquire it from a licensed New York distributor, thereby incurring another mark-up. It pays to shop around. But getting it shipped to your home is another matter….